Start spreading the news: Disneyland is closing to the public on Wednesday, May 4, 2005 to make final preparations for the park's 50th Anniversary celebration, scheduled to start the next day. The resort has begun notifying Annual Passholders in their renewal notices, and vacationers who book through Disney Travel. Disney's California Adventure (DCA) park will be open on May 4 to accommodate those who still intend to visit the resort that day, or who perhaps miss the announcement. As we reported in last week's Park Update: Disneyland, a small electrical fire in the Playhouse Disney sign forced the evacuation of DCA's Hollywood Backlot District on May 15. Eyewitness reports of the duration of the closure ranged from 90 minutes to over eight hours. Fire from Playhouse Disney in Disney's California Adventure park is visible to park visitors. Photo by Rod Overbo, used with permission. Several readers have confirmed that the area was closed for just over an hour, and told us that the fire was put out by the Disneyland fire department, with help from Anaheim firefighters. 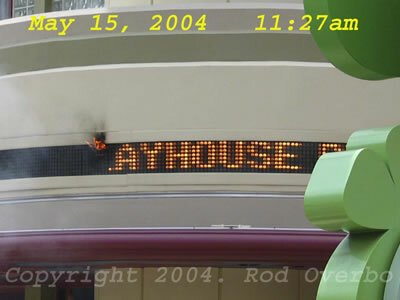 MousePlanet reader Rod Overbo happened to be in the area when the fire broke out, and was able to to snap a photo of the 904-visible (Disneyspeak for a fire visible to park visitors) at Playhouse Disney in Disney's California Adventure park. A reader asked, Do they realize the irony of that name? Because 'zero' is about what you get for your $85! Others noted that the shopping ticket at last month's Tower of Terror event was only $59. Disneyland sources tell us that this is the last year that the Haunted Mansion Holiday event will take this format at Disneyland, and speculate that the Nightmare Before Christmas-themed events will move to Walt Disney World in 2005. Disneyland could then host events based on the classic Haunted Mansion, or move onto a new attraction. Another source tells us that DCA may be the home of future Halloween events, noting that the back story for the newly opened Tower of Terror ride claims that the lightening strike that damaged the building occured on October 31, 1939. Full details and prices of the four packages are available at the Disney Gallery Web site (link). MousePlanet reader Isaac sent us an updated copy of the Disneyland Resort refurbishment schedule. Among the changes, the Enchanted Tiki Room, Aladdin's Oasis and the Plaza Pavillion will be closed July 30, 2004 to March 12, 2005. This puts the squelch on rumors of a Lilo & Stitch Mele Kalikimaka (Merry Christmas) overlay of the Enchanted Tiki Room, and has launched speculation that the Plaza Pavillion may once again be used as a restaurant. Got any interesting news or rumors? Contact us here. Peter Pan's Flight closed through May 28. Carnation Cafe closed through May 29. Alice in Wonderland closed through July 2. Sleeping Beauty Castle walk-through closed indefinitely. Space Mountain closed through 2005. Francis' Lady Bug Boogie closed indefinitely. Sleeping Beauty Castle closed June 21  Sept 18. Aladdin's Oasis closed July 30  March 12, 2005. Plaza Pavilion closed July 30  March 12, 2005. Enchanted Tiki Room closed July 30  March 12, 2005. Snow White's Scary Adventures closed August 23  September 11. Star Tours reduced capacity as each of the four cabins rotate through refurbishment September 722. Haunted Mansion closed September 7  October 1 for installation of Haunted Mansion Holiday overlay. Closed January 1025, 2005 for removal of Haunted Mansion Holiday overlay. Maliboomer reduced capacity (2 of 3 towers operating) November 125, January 322, 31, 2005  March 12, 2005. Matterhorn Bobsleds closed September 13  November 24. Jumpin' Jellyfish reduced capacity January 21, 2005  March 5, 2005. Disneyland Hotel Grand Ballroom closed July 216. Disneyland Hotel Convention Center lobby, upper level & lower level closed July 16  September 1. Disney's Paradise Pier Hotel pool slide & kiddies pool closed through June 5. 2004 Haunted Mansion Holiday Event Thursday, September 30. Reservations accepted at the Disney Gallery Web site (link) on May 24 at 9:00 a.m. PDT. CHOC Walk  this fun-walk through Disneyland park is a fundraiser for the Children's Hospital of Orange County (link). October 3. Disneyland closed on May 4, 2005 to put the finishing touches on the 50th Anniversary celebration. DCA open on May 4. Disneyland's 50th Anniversary celebration begins May 5. If you book a three-night resort stay at any of the Disneyland Resort hotels during the 50th anniversary promotion, your package includes a four-day Park Hopper ticket, a special 50th anniversary commemorative clock and a Walk in Walt's Footsteps tour. The 50th Celebration Package is available onlyfor three-night stays, with arrival dates May 5 through December 31, 2005. The package can be booked through the Disneyland Web site (link), or by calling (714) 520-5060. Annual Passholders can receive a copy of The Disney Treasures book, worth $60, when they apply for a Disney Visa card. The book will be mailed after the cardholder uses the new account. Apply by phone at 1-800-640-5306, and mention card code 26FF. Disneyland Resort Annual Passholders save up to 20 percent on car rentals from Alamo Rent A Car and National Car Rental. Restrictions applyget full details and the necessary discount codes on the Annual Passholder Web site (link). Cleveland Indians: Friday, June 4, 7:05 p.m.
Oakland Athletics: Monday, June 21, 7:05 p.m.
Boston Red Sox: Thursday, July 15, 7:05 p.m.
Seattle Mariners: Sunday, August 1, 1:05 p.m.
Prices are: Terrace Box, $12.50 (reg. $25); Lower View Box, $7.50 (reg. $15); and Upper View, $6.00 (reg. $12). Although there is no limit to how many tickets a passholder can purchase, you must use mail or fax in the order form provided at the Annual Passholder Web site, and you cannot purchase these tickets online or obtain them at the ticket window on the day of the game. See the passholder Web site for details (link). Collect Fastpass tickets for multiple attractions at one time. These packages require a minimum two-night hotel stay, and are good for travel now through July 1, August 29 to November 21 and November 28 to December 23, 2004. You can book this package through your local AAA affiliate travel agent. An additional handling fee of $10 is charged per mailing address. These tickets are available to AAA members only when purchased through AAA offices. These tickets include free parking (the back of the passports note the free parking, so you will need the passport with you when you park your car). The CityPass is $172 ($129 for children). You can purchase the Southern California CityPass with Walt Disney Travel Company packages. Instead of the Disneyland Resort Park Hopper ticket currently included in California packages from the Walt Disney Travel Company, guests can select a Southern California city for an additional charge of $47 per pass ($32 per pass for children 3 through 9). Note: The Southern California CityPass does notinclude the $10 ESPN Zone Arena Game Card, or the California package's feature that allows guests to collect multiple Fastpass tickets at once for free in advance. SL  Southern California Select Annual Pass. SC  Southern California Annual Pass. DX  Deluxe Annual Pass. Visit our Annual Passholders Blockout Dates 2004 page to see more dates. Entertainment schedule: Go directly to the Disneyland Resort schedule for May 24 to 30 at Disneyland.com here.